It is the largest-ever study of its kind, based upon the geographical area covered and the number of drones and other assets deployed, according to Nebraska's Adam Houston. The project will involve four unmanned aircraft systems or drones, a NOAA P3 manned aircraft, eight mesonet trucks equipped with meteorological instruments, three mobile radar systems, a mobile LIDAR system, and three balloon-borne sensor launchers. 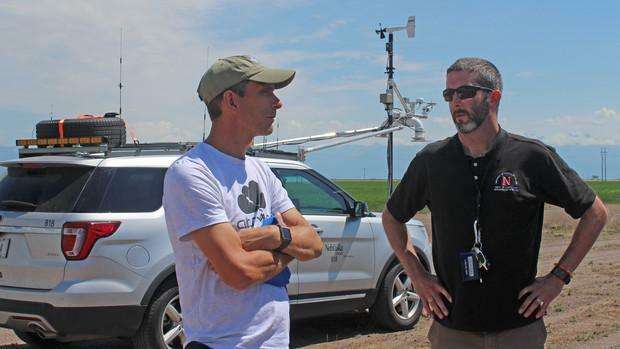 The University of Colorado Boulder, Texas Tech University and the University of Oklahoma, along with the National Severe Storms Laboratory, also are participating. "We are flying more aircraft at the same time," said Houston, associate professor of Earth and atmospheric sciences and one of seven principal investigators. "We've only flown one drone in the past, now we're going to fly four. We can fly in more parts of the storm at the same time, get more data and answer a more extensive set of questions." "There are fundamental problems with tornado warnings," Houston said. "The false alarm rate is high — 75 percent of the time we don't get a tornado. Yet if you reduce the false alarm rate, you also reduce the rate of detection. We need to improve that gap to save lives. We can do that if we can improve our understanding of small-scale structures and small-scale processes that lead up to storms. "We want to know how the storm influences the environment, and vice versa, in the seconds, minutes and hours leading up to the storm and afterwards." The Central Plains, aka "Tornado Alley," serves as a great laboratory to better understand severe storms, he said. "Every place in the United States is vulnerable to super cell thunderstorms. What we learn in this laboratory called the Central Plains is applicable to everywhere — it's geographically agnostic." "There's no getting around it. We're putting ourselves in the path of these serious storms."